It was really good of Sabine to agree to an email interview for me. At the time the site was only a week old, and not only were Sabine’s responses of a high quality, this article has also been responsible for bringing in a lot of new traffic to the site. This was the first interview posted up and it features a first hand account from Australia’s Trevor Keene who took part in the 2006 Nürburgring 24 hour race. Hearing of Trevor’s experiences was both interesting and inspiring. The best thing I got from the interview with Anders and Richard from the ‘Loaded’ project was Anders’ enthusiasm for not only his astonishing automotive creation, but also for being so willing to participate with AUSringers. The link to the site on the ‘Loaded’ website has also been greatly appreciated—thank you! I have featured a lot of video clips from youtube and the like. And while seeing clips featuring Walter Röhrl, Sabine Schmitz or Hans-Joachim Stuck behind the wheel, or even rare footage from Grands Prix past, are always going to be favourites, I really enjoyed this amateur footage of a worked MINI Cooper S. The time set is very respectable—actually it is bloody fast—and the sound of the car is just awesome. Okay, as a MINI owner myself, I admit I am biased! 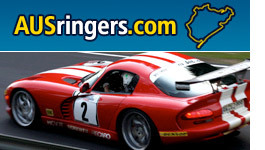 One of the reasons I wanted to start this site was to gather the experiences of other Australians who have made the pilgrimage to the Nürburgring, and while the responses have been moderate to date, I have got a lot out of the stories posted to date. If you’ve been to the Ring and are yet to tell of your experience, please leave a few lines in the ‘Your story’ comments section. Following on from that, please feel free to leave your feedback about this site in the form below. I’d like to know what you have enjoyed and what you would like to see in the future.